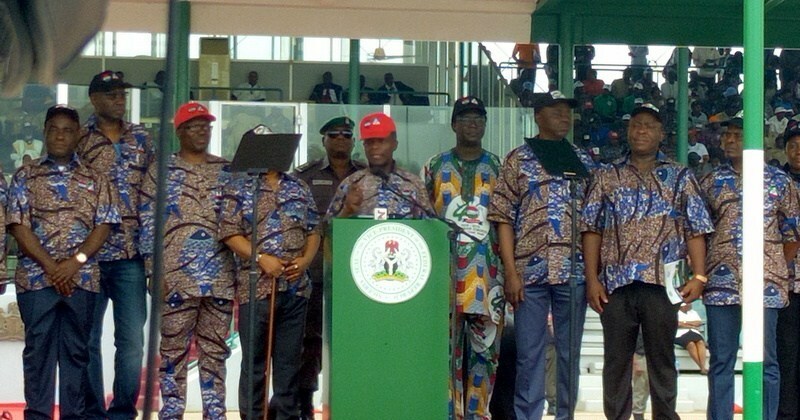 The Vice President, Yemi Osinbajo, has assured Nigerian workers that the Buhari-led administration is not ignoring their demands of better working conditions. He gave the assurance while speaking at the 2018 Workers’ Day celebration at the Eagle Square in Abuja on Tuesday as he explained the implementation of the new national minimum wage. Nigerian workers from different agencies and unions converged at the Eagle Square on Tuesday morning to mark May Day as well as make their demands known to representatives of the Federal Government. President Muhammadu Buhari had in November 2017 set up a 30-member tripartite National Minimum Wage Committee for the negotiation of a new national minimum wage for Nigerian workers. Mr Buhari had said the inauguration of the committee followed the recommendation of a technical committee put in place after the increase in the price of petrol in 2016. He added that the current minimum wage being used in the country had expired. The new wage is expected to take effect from August 2018. The vice president said the argument for a new national minimum wage cannot be protested “because it is the minimum amount of compensation that an employee must receive for putting in his or her labour. “This administration has no intention of ignoring the demands of labour. He called on all members of the Labour Union to remain united and cooperate with the federal government. Mr Osinbajo also stated that security in the nation is a collective responsibility as he urged Nigerians to cooperate fully with security agencies to help bring the perpetrators of criminal acts to justice. He urged Nigerian workers to pray as well as have faith in Nigeria. Also speaking, the Minister of Labour and Employment, Chris Ngige, commended the trade unions for the battles won over the years. He enjoined workers to join the federal government in its fight against corruption. “This would be battle worthwhile as the output would stand the test of time and majorly contribute to national development,” he said. Earlier in his remark, the President of the Nigerian Labour Congress (NLC), Ayuba Wabba, warned the minimum wage committee against missing the timeline for its implementation. He explained that workers are creators of wealth and should be treated as such as well as celebrated. He vowed that the NLC will continue to fight until the new wage is implemented. “The benefits of new minimum wage cannot be over-emphasised. An increase in the minimum wagw will pull many workers out of poverty,” he said. He also lamented the high rate of unemployment and poverty in the country, adding that Nigera’s economic structure does not provide the enabling space for mass industrialisation imbued with the capacity for sustainable jobs. Mr Wabba further urged the government to track and diligently prosecute all corrupt persons in and outside the government. He warned against unlawful and illegal withholding of contributory pension deductions from workers’ salaries and not remitting to their Pension Fund Administrators (PFAs). Meanwhile, our correspondent spoke with some Nigerian workers to find out their agitations. These were all centered on the new minimum wage as well as security in states affected by insurgency. “If you want to help workers in this country, they should just start paying by the hour. Set an amount and pay so. So if as a civil servant, you work for eight or nine hours, you know how much you’re making. “Do this and you’ll know Nigerian youth are not lazy,” he said.